Welcome to Laura Scheibe, South Dakota’s New State CTE Director! Before joining the South Dakota Department of Education, Laura Scheibe’s career as an American diplomat took her all over the world from Belarus to Southeast Asia. Her journey three years ago to South Dakota came as she and her young family were looking to move away from Washington, DC, and closer to relatives. Her move into education, she said, was a natural fit after having spent her career in public service. 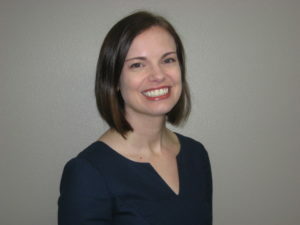 Prior to being named the State CTE Director, Scheibe served as the deputy director of the South Dakota Department of Education’s Division of Accountability Systems, which includes state report cards, K-12 accreditation and helping to lead the creation of the state’s new plan for the Every Student Succeeds Act (ESSA). One of her top priorities is to use that experience crafting the state’s ESSA plan to find more ways to integrate Career Technical Education (CTE) more fully into education and bring the benefits of CTE to more students. Scheibe is becoming the State CTE Director at an exciting time in South Dakota, where Gov. Dennis Daugaard is challenging the state to reimagine what high school looks like for students and how it prepares students for success and opportunity in life. For Scheibe, she knows that robust CTE programs can do exactly that by helping students find their passion and discover their strengths. “It’s about throwing our preconceived notions out a bit to help better prepare kids for the future,” she said. When Todd County School District received a $103,000 grant in 2014 under Governor Dennis Daugaard’s South Dakota Future Fund, the rural South Dakota district put the money to use, administering a survey of local business leaders to identify the career pathways that were most in need in the community. With the information collected through the survey, Todd County School District updated and aligned Career Technical Education (CTE) curriculum to better reflect employer needs. Targeted investments like Gov. Daugaard’s fund, which has since evolved into South Dakota’s Workforce Education Grant program, provide a catalyst for rural districts and institutions to improve CTE program quality and ensure career pathways are aligned with labor market needs and student interest. Improving CTE quality in rural communities is an imperative for all states, yet rural CTE programs often face unique challenges that are not present in more densely populated areas. For example, decentralization, lack of resources and more limited employer relationships in rural communities can result in the preservation of legacy programs over more industry-relevant career pathways. Decisions about what programs to offer are too often driven by the availability of equipment or facilities, teacher supply and even tradition. In Nebraska, the reVISION initiative has helped bring together education and business leaders in 87 districts since 2012. Through the initiative, state officials provide local leaders with labor market information to help develop strategic action plans and design CTE programs that are aligned to regional labor market needs. South Dakota’s Workforce Education Grant program distributes competitive funds to support CTE programs in rural districts. Through the 18-month grant period, the South Dakota Department of Education provides technical assistance and coaching to help local grant recipients maximize the use of funds. Meanwhile, Mississippi’s Community College Board employs a program approval process that requires all postsecondary programs to justify employer need and student demand before they are approved. Further, postsecondary CTE curricula are developed by the Board, ensuring that all learners, particularly those in rural communities, can access the same high quality, industry-aligned content. These examples demonstrate different approaches state leaders can take to empower local leaders and support program improvement in rural areas. 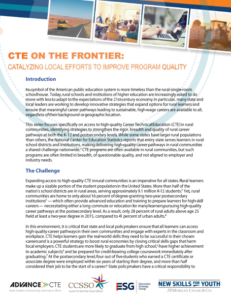 Future briefs in the CTE on the Frontier series will tackle other common challenges, including learner access to the world of work, employing strategic partnerships to increase program offerings and strengthening the rural CTE teacher pipeline. CTE on the Frontier: Catalyzing Local Efforts to Improve Program Quality was developed through the New Skills for Youth initiative, a partnership of the Council of Chief State School Officers, Advance CTE and the Education Strategy Group, generously funded by JPMorgan Chase & Co.
All learning is facilitated by knowledgeable experts. All learners deserve to have quality educational experiences facilitated by individuals with passion, experience and expertise. 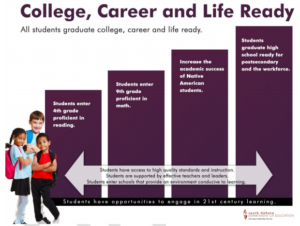 The need for experts qualified to help ensure students gain the real-world experiences they need for success has been increasing dramatically. Individuals with industry expertise provide a perspective to students that traditional academic teachers may be unable to do, and can also help students explore and connect with particular career opportunities. State leaders face numerous barriers in fully achieving this principle, including geographical shortages of available industry experts, and the availability of professional development that provides industry experience to classroom teachers. Build and support a pool of experts that instructors may draw upon to supplement learning. Since the launch of Putting Learner Success First, Advance CTE has been conducting research and policy scans to raise up examples and promising practices related to this principle. Now, when state leaders put their commitment to quality instruction into action, they have access to multiple resources related to instructor certification, teacher externships and professional learning. To address the serious teacher shortage being experienced by districts across the state, the South Dakota State Board of Education changed administrative rules for Career Technical Education (CTE) teacher certification in November 2015, introducing more consistency and flexibility to the certification process. Under the new rules, CTE teachers may receive certification at the Career Cluster or Career Pathway level. A career cluster endorsement requires teachers to pass a state certification exam or complete 15 credits of coursework and allows teachers to teach any course within a cluster, including all pathway-level courses. A career pathway endorsement requires teachers to pass the state certification exam, complete nine credits of coursework, or have 4,000 hours of work experience. With the pathway endorsement, teachers may teach any course within a career pathway, but must complete more coursework in order to earn an endorsement for an entire cluster. To address geographical challenges and expand access to CTE and advanced coursework more generally, the Idaho legislature in 2015 authorized Idaho Career & Technical Education to work with the Idaho Digital Learning Academy (IDLA), a fully-accredited online school serving students in all of the state’s 115 districts, to develop CTE Digital. Through IDLA, Idaho students all over the state can access online CTE coursework. Before a course can be designated as CTE Digital, a CTE certified teacher maps content to CTE standards and develops new content to meet the standards, as needed for existing courses/curriculum. For a new course development, a CTE certified teacher is hired by IDLA to create the course, which typically happens while they are teaching the same course in their district. In this way, the state can ensure that all learners are receiving quality instruction. This 50-state report from the Education Commission of the States (ECS), co-authored by the Midwestern Higher Education Compact, explores policies related to dual enrollment faculty qualifications and identifies four strategies: accreditor-approved qualifications, equivalent faculty qualifications, requirement of a master’s degree, and graduate credit requirements. The report further details state strategies to help classroom instructors meet dual enrollment qualifications. The Southern Regional Education Board (SREB), in partnership with the National Research Center for Career Technical Education (NRCCTE), developed an induction model for new CTE teachers pursuing an alternative route to certification that increases their career commitment, competency and self-efficacy. This report presents key elements of the CTE teacher induction model and provides findings from a five-year field test. This document, produced by the American Institutes for Research (AIR) in 2013, provides state-by-state information on teacher licensure policies for Career Technical Education (CTE) teachers. It includes data on CTE-related teacher certification, certification routes, length of teacher certifications or renewal, professional development and recruitment for all states and D.C.
Advance CTE has partnered with the AIR Center on Great Teachers and Leaders (AIR GTL) to run two working groups as a follow-up from the December 2016 State of CTE report. The first group will focus on exploring innovative roles for industry experts, such as co-teaching and part-time teaching, and the second group will explore the strategies available for secondary and postsecondary partnerships. In early 2018, AIR GTL will publish summary reports on the activities of both working groups. As part of a series of briefs on the challenges unique to providing quality CTE in rural areas, Advance CTE will be drafting a brief specifically on recruiting and retaining teachers in rural areas. This month Tennessee Governor Bill Haslam’s vision for increasing postsecondary credential attainment in his state came one step closer to reality. On May 24, Gov. Haslam signed the Tennessee Reconnect Act into law, providing tuition scholarships for adult learners to access one of the state’s many community colleges and Colleges of Applied Technology. The Reconnect Act, a core piece of the Governor’s 2017 state of the state address, will be available to eligible non-degree holding adult students who are admitted into qualifying postsecondary institutions beginning in the fall of 2018. The program is expected to have a substantial impact. The Tennessee General Assembly Fiscal Review Committee estimates that 5,503 additional part-time students and 4,102 full-time students will be eligible to receive the grant award in Fiscal Year 2018-19, at an estimated cost of $8.5 million. Expanding access to postsecondary education and training has been a priority for Gov. Haslam during his tenure. In 2014, Tennessee launched the Tennessee Promise program, a last-dollar tuition scholarship that has seen tremendous growth and success since it was proposed in 2014. The state is seen as a pioneer in expanding access to free community college. Directing the State board of Education and the Department of Education to study other state systems of career preparation to identify opportunities to leverage flexibility under the Every Student Succeeds Act to better prepare Tennessee graduates for careers. Meanwhile, Iowa passed a law to enhance digital literacy with new K-12 computer science standards and funding for teacher professional development. The legislature’s goal is that by July 2019, all elementary, middle and high schools in the state will offer some form of computer science instruction. The bill directs the Department of Education to establish a computer science education workgroup to put together a plan to adopt new graduation requirements, integrate computer science instruction into CTE pathways and develop new K-12 computer science pathways. Additionally, the law establishes a computer science professional development incentive fund, which Governor Terry Branstad has proposed to fund at $500,000 in his 2019 budget. The fund is designed to help school districts pay for teachers to get additional training on computer science. Speaking of standards, the South Dakota Board of Education voted in its May meeting to adopt new Career Technical Education (CTE) standards in six Career Clusters®: Agriculture, Food and Natural Resources; Arts, Audio-Video Technology and Communications; Finance; Health Science; Human Services; and Manufacturing. The standards were developed by workgroups of secondary CTE teachers, postsecondary faculty, industry representatives and others. Standards for five additional Career Clusters® will be developed later this summer. Thatâ€™s right, itâ€™s time again for state legislatures to begin work on yet another year of lawmaking. Itâ€™s also time for our annual publication of â€œ2015 Year in Review: State Policies Impacting CTE,â€ a joint venture of NASDCTEc and the Association of Career and Technical Education. You can find the report here onÂ January 21. Have you signed up for our January 21 webinar yet? Join us as we unpack the policy trends from 2015 and take a deep dive on major efforts in Colorado with state Senate Minority Leader Rollie Heath and Dr. Sarah Heath, Assistant Provost for CTE with the Colorado Community College System. The governorsâ€™ addresses often provide a window into the major issues that will dominate the yearâ€™s legislative agenda. Already, it seems to be a mixed bag fiscally with some governors citing the acute budget crunch facing their states. Others are reveling in their surpluses and proposing major increases to core services such as education and health care that were often neglected as the states recovered from the Great Recession. Virginia Governor Terry McAuliffe called for transforming the Commonwealthâ€™s education and workforce development systems to better meet the demands of the future. McAuliffe hailed the bipartisan backing of his budget proposal Go Virginia, which seeks to foster regional collaboration among government, businesses and education. He highlighted the need to build an education system that emphasizes entrepreneurship, hands-on learning, early college courses and industry credentials. He also called for an end to an education system beholden to seat-time. He also called for more than $1 billion in new funds across all levels of education, including $139 million for K-12 education and $25 million to Virginiaâ€™s community colleges to produce more industry certifications and occupational licenses. In Idaho, Governor Butch Otter proposed a 9 percent increase for the stateâ€™s community colleges as well as $5 million for college and career advising, and $1.1 million to develop a competency-based education system for up to 20 school districts. Other proposed spending includes grants for STEM and computer science. Finally, West Virginia Governor Earl Ray Tomblin proposed restructuring the stateâ€™s current innovation zone system with a new program, Innovation in Education, which reallocates $2.5 million to help schools develop new methods to increase student interest in STEM and entrepreneurship. Other governors (California, Georgia and New York) proposed major K-12 funding increases, but it remains unclear how and if that will impact CTE. Similar, several governors (Georgia, Indiana, and South Dakota) also focused on increasing the salaries for K-12 teachers and other ways to recruit and retain teachers. There are a lot of issues competing for attention in a governorâ€™s State of the State address from pensions to health care to infrastructure to education. So itâ€™s notable of the 31 speeches given this month, Career Technical Education (CTE) has found its way into roughly 40 percent of them, particularly because governors use this speech as a way to outline their priorities for the year and highlight successes. In some instances, CTE was only mentioned in passing such as in Alaska, where the governor called for increasing educational opportunities for CTE. However, states such as in Indiana, California, and Nevada among others, governors proposed major investments in CTE as a means to prepare a skilled workforce to compete for tomorrowâ€™s jobs and position the state for economic prosperity. Here is a quick recap of the highlights as of January 26. Weâ€™ll continue tracking the remaining speeches and budget proposals, and bring you an update in the coming weeks. Although CTE didnâ€™t make it into Gov. Jerry Brownâ€™s speech in California, it received a major boost in the governorâ€™s proposed budget, which was released shortly after. Brown proposed the CTE Incentive Fund, which calls for $750 million over three years in one-time funding. The grant program would require a dollar-for-dollar match by the participating K-12 schools and encourages collaboration with other local agencies to form regional partnerships. The budget also proposes nearly $30 million to grow and expand apprenticeships. Declaring his budget the â€œeducation budget,â€ Gov. Mike Pence proposed increasing CTE funding by $20 million a year. The money would be directed through the stateâ€™s Indiana Works Councils. â€œBy providing $20 million a year to create more career and vocational opportunities and improving the way we fund those courses, we will dramatically increase the number of students who graduate career-ready, and increaseâ€”by fivefoldâ€”the number of students who graduate with an industry-recognized credential by 2020,â€ Pence said. Gov. Steve Beshear praised the stateâ€™s CTE system in his State of the Commonwealth. â€œRecognizing that the four-year university path isnâ€™t the best route for everyone, weâ€™ve made our career and technical programs more rigorous and applicable to real-life jobs that demand high-level technical knowledge. These arenâ€™t the so-called â€˜shop classesâ€™ of yesterday but modern training with a touch academic foundation,â€ Beshear said. Beshear also called on the stateÂ to implement the recommendations of theÂ Dual Credit Task Force to improve the quality of these courses and help students cut the time and cost of their postsecondary education. Gov. Brian Sandoval used his speech as a bully pulpit for increased education spending. Citing Nevadaâ€™s worst-in-the-nation high school graduation rate as â€œour most troubling education statistic,â€ Sandoval called for $1.1 billion in additional funds for education. Specific to CTE, Sandoval proposed new grant programs to ensure students are college- and career-ready, including an expansion of CTE, Jobs for Americaâ€™s Graduates and STEM education. â€œWe must give local school systems better flexibility to train and hire subject-matter experts to fill long-term vacancies in critical subject areas. For more CTE and workforce coverage, check out proposals and praise from Delaware, Idaho, Michigan, Missouri, Nebraska, South Dakota, and Vermont. Yesterday, we released a summary of several state of the state addresses, focusing on their implications for CTE in the year ahead. Below is the second installment in this CTE Month special series, highlighting more governors who took time out of their state of the state address to endorse programs for high-quality CTE in their state. During the State of the State Address inÂ Connecticut, Governor Dannel Malloy embraced â€œhands-on learning,â€ committing his administration to working with private-sector partners and educators to provide for early college and dual enrollment initiatives. He also commended the P-Tech program, a collaboration between IBM and a number of New York City high schools that guides students through high school and provides for an additional two years of instruction. Graduating students complete the P-Tech program with advanced credentials and Governor Malloy expressed his desire to emulate this in Connecticut by offering a comprehensive, skill-centered pathway for students to credentials above and beyond a high school diploma. GeorgiaÂ Governor Nathan Deal touted the state’s High Demand Career Initiative, designed to bring together leaders of the University System of Georgia, technical colleges and schools, and state industry leaders to understand labor market needs, as well as a $10M loan program for students attending technical colleges. InÂ Indiana, Governor Mike Pence outlined his desire to make CTE an option for every Hoosier student. He encouraged not only the development of programs to allow secondary students an easier path into postsecondary CTE programs, but also for adult education that would allow professionals to seek retraining to improve their skills and competencies making them more competitive in todayâ€™s labor market. Governor Terry Branstad ofÂ IowaÂ promoted his Iowa Apprenticeship and Job Training Act, entailing a number of initiatives to increase student access to apprenticeships by tripling funding for apprenticeships under the stateâ€™s 260F worker training program. Â He also cited his stateâ€™s recent success expanding STEM education, anticipating 60,000 or more students will have access to STEM programs in the state as a result of the efforts of the STEM Advisory Council, an initiative led by Vermeer CEO Mary Andringa and Lieutenant Governor Kim Reynolds. Governor Sam Brownback ofÂ KansasÂ touted a 75 percent increase in enrollment in CTE since the state launched its Career Technical Education Initiative. The sweeping plan from 2012 included $8.75 million for CTE programs, covering tuition for students taking postsecondary CTE courses, $1.5 million to high schools that encourage students to earn industry recognized credentials and allotting funds to spread the word about job opportunities for CTE graduates. InÂ Maryland, Governor Martin O’Malley announced his desire forÂ every high school student in Maryland to graduate with a modern technical skill and a year of college credit already earned. Governor ofÂ New HampshireÂ Maggie Hassan embraced developing STEM education in the Granite State as a response to the needs of the state’s high-tech industry.Â Governor HassanÂ cited restoring previously cut funds to New Hampshire higher education as a strategy toÂ enticeÂ businessÂ to the state, and indicated thatÂ a well-trained and career-ready workforce was key to economic development in the granite state. In the Oklahoma State of the State Address, Governor Mary Fallin called education beyond high school â€œthe new minimumâ€ for Oklahomans entering the workforce, and expressed her desire to increase the number of graduates seeking qualifications beyond a high school diploma â€œâ€¦either by attending college or a career technology center.â€ She also cited increasing numbers of Oklahomans seeking degrees or certificates as a result of collaboration with CareerTech in the Complete College America initiative. InÂ South Dakota, Governor Dennis Daugaard focused heavily on CTE, which he labeled â€œâ€¦the intersection of education and economic development.â€ In a series of proposals to enhance CTE and draw more students into technical fields the governor advocated for $5 million in Governorâ€™s Grants for CTE to improve collaboration between secondary schools offering CTE courses, along with $3.8 million in Future Fund grants to technical institutes for workplace priority areas and extra funds for scholarships for students in high need fields. Â He also touted Building South Dakota, the economic development fund that incorporates infrastructure, housing, and development funds along with CTE funding. Continuing with his year-old Drive to 55 initiative, (a program to ensuring 55 percent of his stateâ€™s citizens possess credentials above a high school diploma by 2022), Governor Bill Haslam of Tennessee voiced his support for expanded CTE and career readiness programs. Adding onto Drive to 55â€™s expanded dual enrollment, workforce readiness and curriculum alignment initiatives, Governor Haslam announced the â€œTennessee Promiseâ€ program. Tennessee Promise will provide Tennessee secondary graduates with the opportunity to go to two years of community college or college of applied technology education free of charge. Continuing his push for expanded educational opportunity, Governor Haslam included in his address further funding for college expansion and renovation across the state, including $65 million for expanding two of the largest community colleges in Tennessee.